It has been a while since the children visited KidsSTOP (read our previous experience here), but the moment the children entered KidsSTOP, they seemed to have known the place inside out! 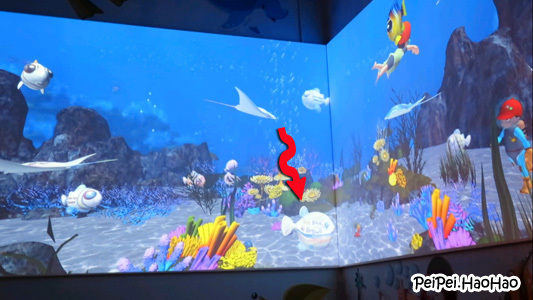 There is a new exhibit Ocean's Buddies, which is a marine conservation project that aims to educate young children on the marine life and how they can do their part to protect the environment. The highlight is a visually virtual ocean floor projected onto a giant wall. During the Marine Conservation activity that takes place daily at 10 a.m. and 4 p.m., the educator shared with the children about why we should not throw rubbish into the sea. The children then chose the colouring sheet of their choice, and used Pilot FriXon pens to colour. Magic happened when the children placed their colouring sheet under this machine! Their sea creatures came alive! They were transformed into 3-dimensional form and joined the other sea creatures on the wall! Look at Pei Pei's creation indicated by the red arrow! Oh, so what is so special about the Pilot FriXon pens that the children used? The ink will disappear when it is subjected to heat. So the colouring sheet can be recycled and re-used up to 5 times! This is a great idea to demonstrate how we can recycle and re-use materials! The wall mural illustrates how a polluted sea traps and suffocates marine life. It aims to educate children that as harmless as littering may seem, the collective damage can cause serious harm to marine life. The children had a great time at KidsSTOP, where they couldn't stop playing and learning! Marine Conservation activity: daily 10 - 10.30 a.m., 4 - 4.30 p.m.
Disclaimer: We were invited to KidsSTOP. No monetary compensation was received. All opinions and all photos are mine.